I know I just posted but I had to mention one tiny little wonderful discovery I made with three tiny little wonderful girls. 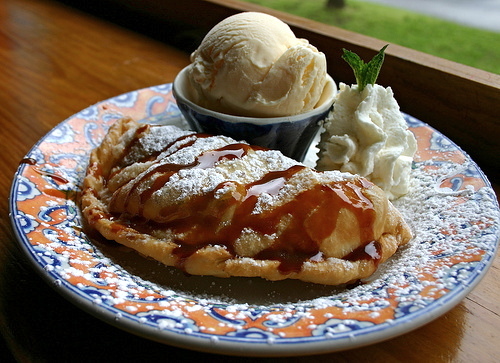 Chocolate and Banana Empanadas which are $7 for two thick pastries filled with warm chocolate and bananas, baked, covered in sugar and cinnamon, drizzled with caramel and chocolate and paired with strawberry puree. Yes, I ordered them, took them home, devoured them and it was the happiest 10 minutes of my Thursday. The Dessert Burrito also $7 for one tortilla filled with blueberries and cream cheese, fried, and then rolled and dipped in the same glorious toppings. No, I did not get these too, I’m not a size 2 for nothing… I’ll probably hit the gym at 6 am now, but seriously, go there, go there now, well not now but soon….. Tell them I sent you. They don’t know me, but I’ll still feel cool.